Let me tell you this story. Around Thanksgiving last year (mind you I was like 5 months pregnant), Mike and I drove through New Orleans on our way to his parent’s house in Houston area. Stopping in New Orleans was one of our favorite things on the drive from Raleigh to his parent’s. We love that city. One of our favorite restaurants is Peche in the Arts District. It is right by the Hotel Modern where we have stayed quite a few times. When we were there I got so SOO excited about these spicy brussels sprouts we had and maybe it had something to do with being pregnant, but I became obsessed. Since then, I have been trying to figure out how to make something similar. Cue, the Love and Lemon’s Cookbook showing up on our doorstep. I poured through it choosing some recipes for the week and the season like I love to do whenever I get a new cookbook. 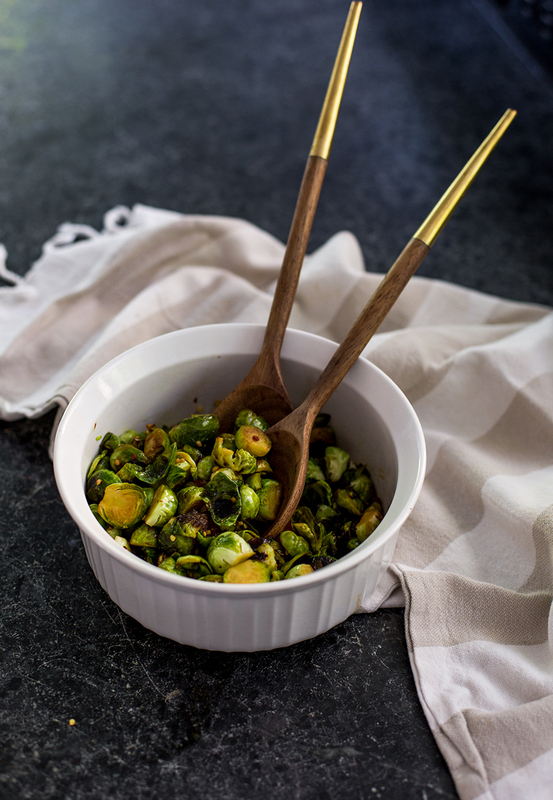 One of the recipes in there was for a recipe for Coconut Rice with Brussels Sprouts in it and I had just bought some Brussels Sprouts so I thought it would be fun to at least give the recipe a try for the Brussels Sprouts section and decided to give it a try. When we tried them I was instantly in love with the flavor and felt that I had finally discovered a similar recipe to the ones from Peche. Throughout the summer these were on repeat, but then I didn’t have all the ingredients one night and simplified the recipe a little more to just the basics I had and they were just as good, so I thought I would share this really simplified version of Jeanine’s awesome ones meant for a larger dish. If you don’t have her cookbook do yourself a HUGE favor and add it to your shelf. It is such a great one for anyone who wants great veggie recipes! 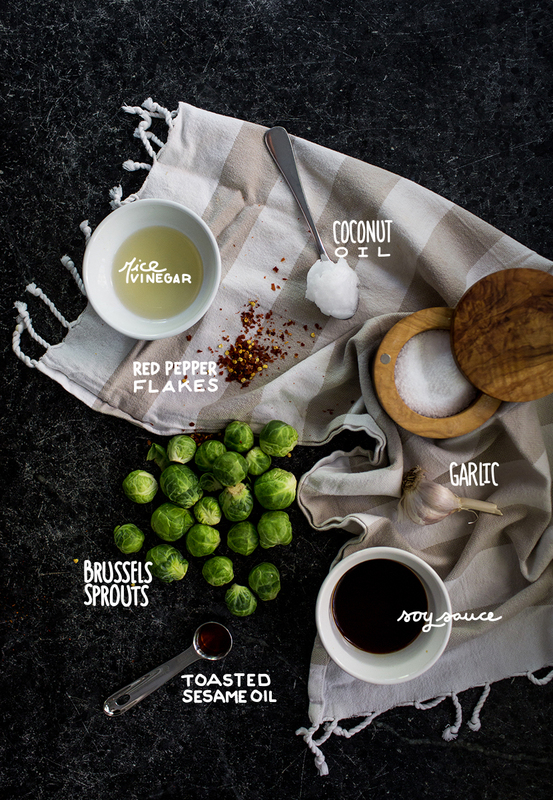 Before starting the burner, mix together everything but the coconut oil and Brussels Sprouts in a bowl. Make sure to combine as well as you can. 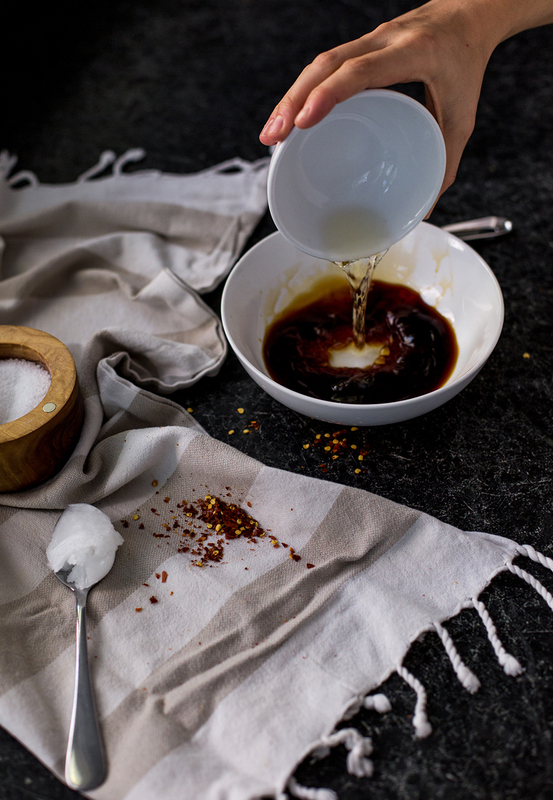 To make, warm the coconut oil in a frying pan at high heat. 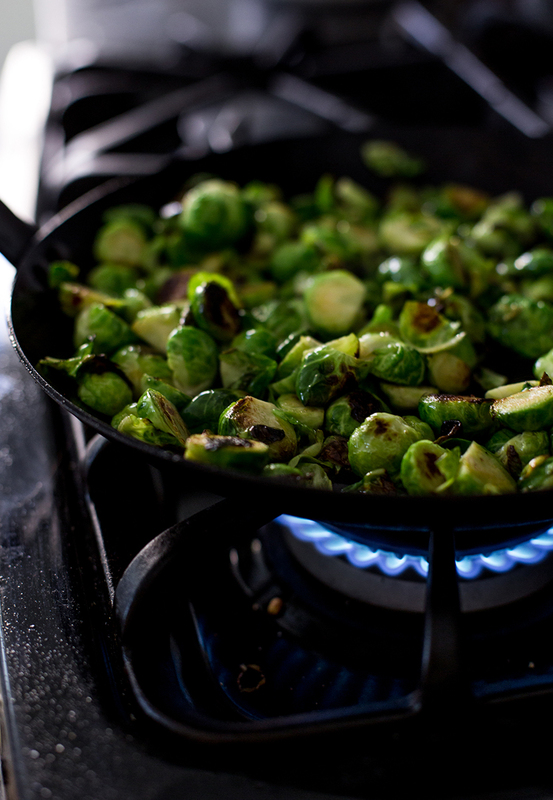 Once the oil is melted toss in the sprouts and allow to start frying on one side. After 2-3 minutes they should be ready to turn and toss. Cook again for another 2-3 minutes. Once they are brightening and becoming cooked turn the heat down to medium or close to low depending on your stovetop and heat source. Pour the sauce over the top and toss it all together. Let cook for another 2 minutes and then it is ready to serve and enjoy. Very simple. Very yummy. Very quick to make. Can you ask for anything better? Love & Lemons is great. 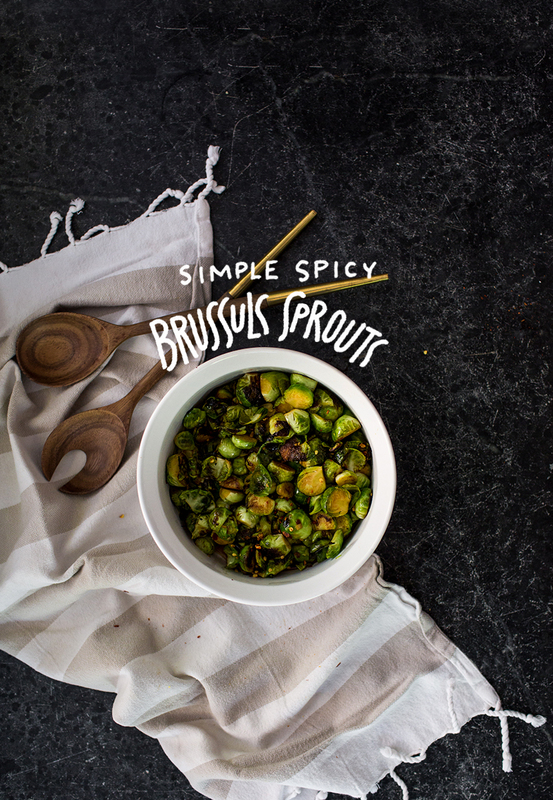 And so are brussels sprouts, spicy or not (though spicy is awfully nice). Ooh these look delicious! 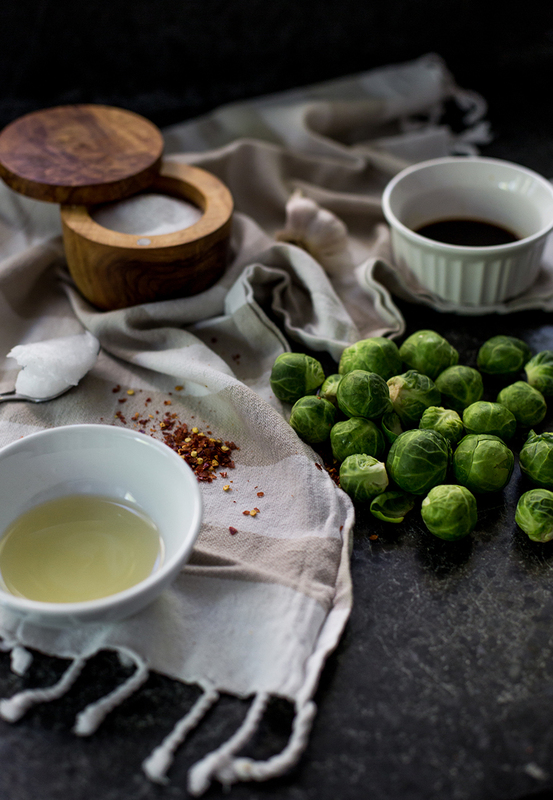 I’m always looking for new ways to cook brussels sprouts! yum! we always brown them on the stove and then pop them in the oven to get nice and crispy for like 30 minutes. garlic, red pepper flakes, salt & pepper topped with fig basilmic vinegar. my favorite treat! Quick & simple ! I’m in!! !